I remember watching a show on TV (pretty sure it was a movie) in black and white (although could have been shot in color, just viewed on a B&W set) in which a ventriloquist's dummy seemed to become sentient with murderous intent. It is not "The Twilight Zone": The Dummy (1962), but may have been of similar vintage. If I recall correctly, the story combined elements of suspense and intrigue/whodunnit amongst a group of characters (not just interplay of ventriloquist and dummy as in the 'Zone episode I mentioned), and I think the ending left some ambiguity as to "who done it" and whether the dummy was truly alive within the context of the story or just in the mind of one or more characters. Can anyone help me identify the movie or TV show? "Dead of Night" (1945). A group of people are gathered together, each tells a tale. Among them, a story of a ventriloquist and his dummy. Could you be referring to the movie "Magic" based on William Goldman's book by the same name? Book published in 1976, the movie starred a young Anthony Hopkins. 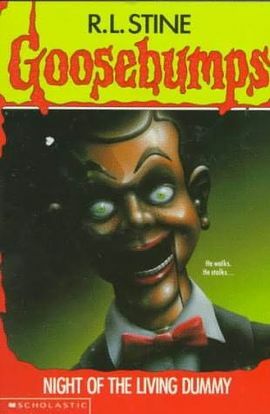 It might be a book (or tv episode) in the Goosebumps series, specifically from the Night of the Living Dummy storyline. You can check out the Night of the Living Dummy episode from the Goosebumps TV show here.